August 29, 2010 - Gulfstream Aerospace Corp. announced that its ultra-long-range, ultra-large-cabin Gulfstream G650 recently reached Mach 0.995 as part of its 1,800-hour flight-test program. Accomplishment establishes G650 as world’s fastest civil aircraft. In order to achieve the maximum speed of Mach 0.995, Gulfstream experimental test pilots Tom Horne and Gary Freeman along with flight test engineer Bill Osborne took Serial Number (S/N) 6001 into a dive, pitching the aircraft’s nose 16 to 18 degrees below the horizon. During the dive, flutter exciters introduced a range of vibration frequencies to the wing, tail and flight control surfaces to ensure the aircraft naturally dampened out the oscillations without further action from the pilots. Even under such extreme circumstances, the G650 performed flawlessly. Members of the G650 flight-test crew celebrate achieving Mach 0.995. 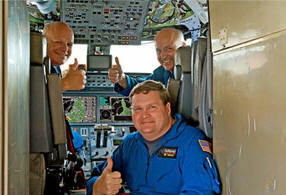 From left: Senior experimental test pilots Gary Freeman and Tom Horne and flight-test engineer Bill Osborne. During the flutter test missions, a team of multi-disciplinary engineers in Gulfstream’s state-of-the-art telemetry center in Savannah monitored the aircraft’s behavior and determined real-time the damping characteristics of the aircraft. As S/N 6001 continued with flutter testing, S/N 6005 completed initial phase manufacturing and began engine testing. S/N 6005 is the fifth and final aircraft in the G650 flight-test program. Each aircraft in the program has a specific purpose, with S/N 6001 focused on envelope expansion, air data calibration, flutter, in-flight performance and flight controls. S/N 6002 is used to evaluate the aircraft’s systems as well as its takeoff and landing performance, while S/N 6003 tests the avionics, in-flight load measurement and ice protection system. S/N 6004 will be the first G650 outfitted and tested with a full interior, which is currently being installed. S/N 6005 will participate in the reduced vertical separation minimum testing. 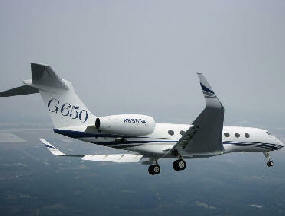 The G650 flight-test program officially began on Nov. 25, 2009. Through Aug. 25, the four airplanes currently flying in the program have completed more than 170 flights and 575 flight-test hours.